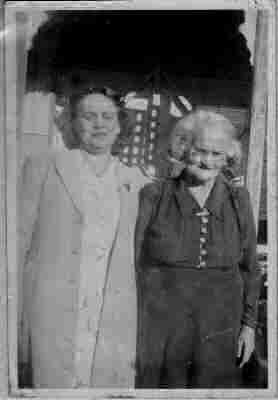 Frances Ellen WOOLGAR nee WHITE and her daughter Dorrie Frances Ellen WHITE was born circa 1877, the daughter of Philip WHITE, a labourer. She married Edwin James WOOLGAR on 26 October 1896 at Holy Cross Church, Bearsted, Kent and the couple then left England and emigrated to Darling Downs in Queensland Australia. They had nine children and the youngest child was Doris WOOLGAR. Doris was born sighted, but became blind after contracting the plague as a child shortly after the end of WW1. This photograph has been very kindly donated to our web site by Tonia Andrews, the great granddaughter of Edwin James WOOLGAR and Frances Ellen WHITE.